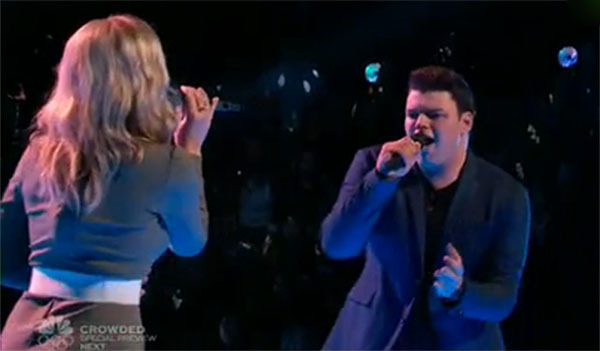 Nate Butler and Natalie Yacovazzi from Team Adam sings ‘Hallow’ on The Voice Season 10 Battle Rounds, Tuesday, March 15, 2016. “Natalie, I think you have originality. Nate has pitch perfect voice, you sounded like Adam,” said Blake Shelton. “To me it’s neck and neck. It’s really hard, you guys are both strong singers. Natalie you have super powerful voice,” said Christina Aguilera. “Nate have control in his voice that is so interesting. Natalie, you have that energy,” said Pharrell Williams. “Natalie, this is the song you should be thriving by singing. Nate, this is the song the put you bit of discomfort zone. Both of you did a great job,” said Adam Levine. The winner of this battle is Nate Butler. No steam for Natalie Yacovazzi. Watch their performance on the video below.